This is a modified version of the recipe found here on allrecipe.com. My big problems with the original version are that it uses canned chicken, which I just find gross. Plus it has you put it in a slow cooker to warm it all up. That probably isn’t a bad idea if you make a ton of it, but I’ve found just heating it up in a casserole dish and leaving it out on the table it stays warm for a really long time, and it’s almost always completely gone before it gets cold anyway. So here goes… Buffalo Chicken dip with updates. I have heard, though I haven’t tried it myself, that you can use Blue Cheese dressing instead of Ranch if you really are opposed to ranch. As I’ve said, I never tried it. For the cheddar, I definitely recommend using an actual block of cheddar cheese, not the pre-shredded stuff in the bag. I’ve tried both and the real cheddar version comes out much smoother and less oily. I think that is somehow related to the coating they apply to the bagged stuff to keep it from sticking to itself. I used the orange extra sharp New York variety, but not sure it matters much. You don’t have to bake it in the oven right away. You can make everything ahead of time keep it in the fridge and then pop it in the oven when you’re ready for it. 1 3/4 cups shredded cheddar cheese, divided into 1 1/2 cup and 1/4 cup portions. Serve with: carrots, celery, chicken crackers, tortilla chips, cut up slices of bread, whatever you like to dip! Boil your chicken until cooked through. I think it takes around a 20 minutes to a half an hour, but I’ve never timed it. Shred the chicken. My nifty trick for shredding chicken: put the cooked chicken in the bowl of your kitchen aid mixer and turn in on to medium. Give it a minute or so and you’ll have perfectly shredded chicken!!! (it might work with a regular hand held mixer or a food processer, though I’ve never tried. In a skillet, add together chicken and hot sauce (skillet on 6 or 7). Mix together until everything is well heated through. Add the cream cheese and ranch dressing into skillet mixture. Stir together until mixed through and the cream cheese is melted. Add in 1 1/2 cups of your cheddar cheese. Again stir until well mixed and cheddar is melted. Transfer everything into one or two small casserole dishes. I used the smallest ones I have which are probably 1 1/2 quarts. It all fits. Put in the oven at 350 degrees until heated completely through, about 20-25 minutes. I usually keep the cover on it for 15 minutes so the cheese on top doesn’t burn, but then take it off towards the end to allow it to brown up a bit. Posted in Appetizer and tagged chicken, football. Bookmark the permalink. So this is an amazing recipe that will take a bit of customization each time it’s made. I don’t think there is any way to make this a standardized recipe. But, don’t let that scare you away from it! With some easy steps you can make this work every time! The basic order of this recipe is to prepare your garlic bread and all of the pasta/sauce ingredients. For our garlic bread we like to use Stop and Shop’s brand garlic butter with whichever bread makes the most sense. In this case it was our local bread company’s olive oil/ sea salt ciabatta cut in half and buttered with the garlic butter. Anyway,once you have all of the ingredients prepped, and the oven preheated for your garlic bread, you can expect about 45 mins to 1 hour of cook time. Trust me, it’s worth it! Heat a skillet then add 2 TBSP butter, and 2 TBSP olive oil. Prepare the chicken by pounding it to an even thickness (if needed). Salt and pepper both sides of the chicken, then douse completely in flour. Place 2-3 pieces of the chicken in the skillet and cook until heated through about 9-12 minutes. Flip each piece of chicken approximately every 2-3 minutes. My skillet was at heat level 5.5-7. Don’t let the oil/butter mixture burn. After the first batch is cooked through, place on a plate and set aside – I put mine in the warmer drawer of my oven. Add 2 TBSP of butter and 2 TBSP olive oil to the skillet and cook the remaining 2-3 pieces of chicken. Once cooked through, set them aside with the others. Once the chicken is cooked, turn the skillet down to medium heat (setting 5 on my stove). Add the wine, broth, and lemon juice. Use a whisk to mix it together and to scrape the bottom of the pan. Allow this mixture to bubble gently until it is reduced by about half. Meanwhile cook the angel hair per package directions until al dente. Also make sure your garlic bread is cooking! Finally serve your angel hair, chicken, and sauce on a plate. Top with fresh cut parsley and Parmesan cheese. Again, garlic bread in some variety is a perfect side. Posted in Dinner, Pasta and tagged chicken, Italian, lemon, pasta. Bookmark the permalink. Wow, I just made these today and they go straight to the blog! I have pinterest to thank for these guys. Prep: In a small bowl mix together the wet ingredients: vanilla, the egg, lemon zest, and lemon juice. In another small bowl mix together the dry ingredients (minus the powdered sugar): the salt, baking powder, baking soda, and flour. To make: Cream together the butter and sugar. Next, whip in the wet ingredients. Stop the mixer and scrape down the sides. Then slowly mix in the dry ingredients (minus the powdered sugar). Once mixed again scrape down the sides of the bowl and mix again. Pour the confectioners sugar onto a small plate. Roll dough into a heaping teaspoon sized ball then roll the dough balls in the powdered sugar. 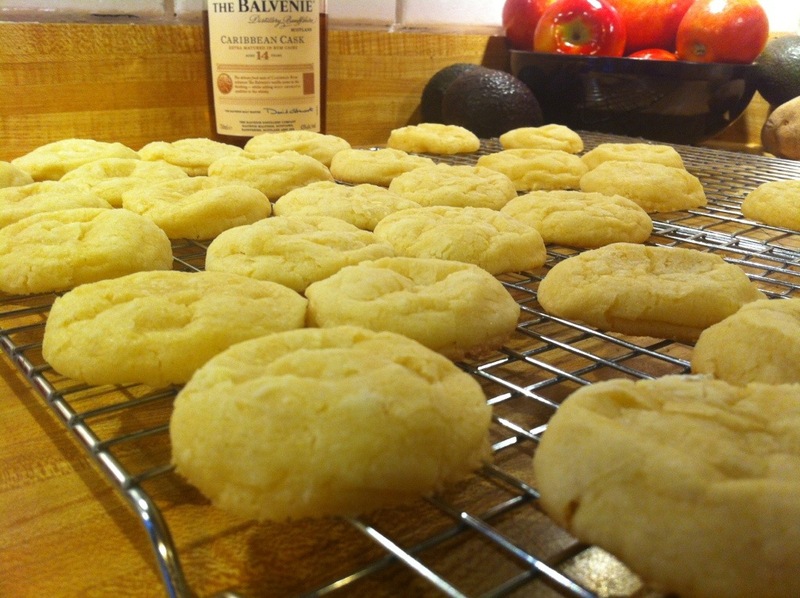 Place onto cookie sheets. Bake for 9-11 minutes (mine were perfect at 10 minutes). 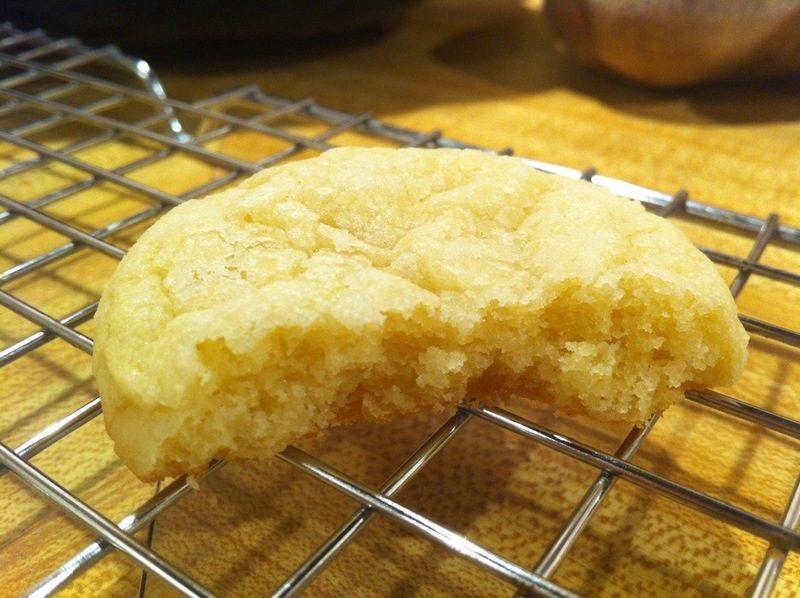 Cookies are done when they are matte (not shiny) on top and lightly browned on the bottom. Posted in Cookies and tagged cookies. Bookmark the permalink. So, I’ve presented the special meatloaf already, but what about regular ole everyday meatloaf? This recipe is one of my favorite comfort food standbys. It deserves no more special introduction than that! Bake until thermometer in the center reads 165-170, about 45 mins to 1 hr. My husband prefers to pour turkey gravy all over it, but to me the only topping for meatloaf is Worcestershire sauce! Yum. Serve with mashed potatoes and some steamed broccoli and enjoy! Posted in Dinner, Weeknight and tagged beef, meat, meatloaf. Bookmark the permalink.